Maryland State Education Association | Help Change The World. The Future Of The County Is Now. Maxwell hires former Baker aide and creates yet another Blunder. 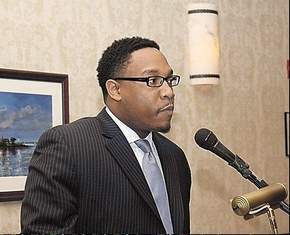 Prince George’s County Schools Chief Kevin M. Maxwell has hired Christian Rhodes, the education adviser to County Executive Rushern L. Baker III, to join his executive team. Rhodes will become the executive board liaison and strategic partners officer. Rhodes was a union official before he joined Baker’s staff almost two years ago. He previously served as a political organizer for the Maryland State Education Association, the state’s largest teachers union. As Baker’s education adviser, Rhodes was tasked with improving coordination among various branches of county government, including the formulation of the school budget, pursuit of educational innovation and reform and advocacy on both a state and national level, all roles traditionally held by the school board. He described his new duties as an extension of his old ones. Rhodes, who went to school to become a teacher, said the decision to move from the county administration building to school headquarters was both personal and professional. Rhodes said it is too soon to discuss projects that he hopes to enhance, but noted that whether it is literacy, ninth-grade promotion or graduation rates, he hopes to be able to lead the school system in partnering with organizations to help it meet its goals. He is one of several new hires Maxwell has made since he took the helm of the school system 15 months ago. Many of the positions, like Rhodes’s, are newly-created. Rhode’s salary is $138,278. >>Read more >> Source Washington Post. A fearless and effective watchdog is critical in fledgling democracies like in Prince George’s where institutions are weak and pummelled by political pressure. When legislatures, judiciaries and other oversight bodies are powerless against the mighty or are themselves corruptible, the media are often left as the only check against the abuse of power. This requires that they play a heroic role, exposing the excesses of presidents, prime ministers, legislators, county Executives, CEO’s and magistrates despite the risks. The media also serve as a conduit between governors and the governed and as an arena for public debate that leads to more intelligent policy and decision-making. In the above scenario involving Mr. Rhodes, the appointment clearly creates a conflict of interest on multiple fronts and will lead to many problems in the future. Mr. Rhodes served as Election Manager for Verjeana Jacobs (disgraced former Board chair). Mr. Rhodes Previously worked for Maryland State Education Association and Prince George’s County Educator Association which is involved in breach of contracts and advancement of misconduct within the Maryland school system. Both Mr. Rhodes and Dr. Eugene Banks (current BOE chair) are tied to National Educator Association (NEA). Any teacher expecting help from both or the teacher union in case of trouble, Good luck with that! Mr. Rhodes is an extension of Mr. Rushern Baker within the school system which in turn polarizes the county school system. High salaries in the midst of crisis when we demanded many reforms at Sasscer administrative Building for such is unacceptable! High number of homeless students who have nothing to eat when the well connected friends and family in the Baker led administration is “eating big” is unwelcome recipe in the middle of a recession. The students are not doing so well academically. It’s time to demand answers and stop the eating at Sasscer! Contact your legislator today and the media say “NO”. It’s time to Stop the blame and Fix the Real Problems in the county.